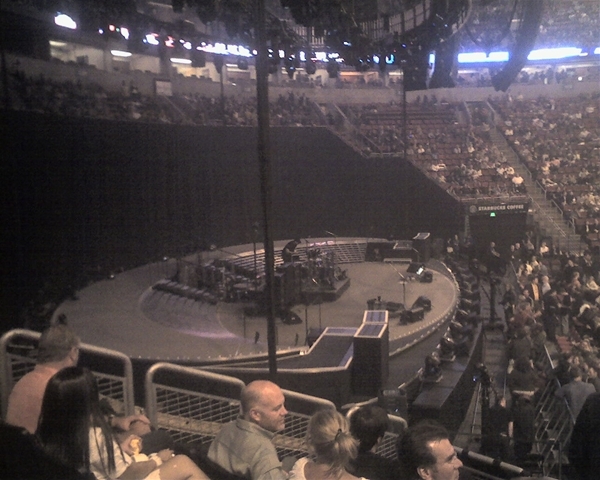 This was the first of two Police concerts in Seattle. I always enjoyed seeing Sting, and it was great to hear him play those old Police songs with some of the finest musicians out there. But in the back of my mind, I was always wondering what it would have been like to see him with Stewart Copeland and Andy Summers back in the day. On Wednesday, June 6, I found out. I guess something important to know up front is that Stuart Copeland is one of my favorite drummers, right up there with Neil Peart of Rush. No two drummers have influenced me more. I've followed Copeland's solo career, from his soundtrack work in "Rumblefish" and "Wall Street" to his more recent work in Oysterhead with Les Claypool. Copeland has made an indelible mark on drumming with his hi-hat technique, a "controlled chaos" style that touches on Keith Moon of the Who, and his unique blending of Ska rhythms with rock. If I were to pick two favorite Copeland tracks with The Police, I guess I'd go with "Can't Stand Losing You" and "Spirits in the Material World." The former I played with a band in college; I still remember learning his 3-against-4 sidestick rhythm (something I still use today). The latter includes some amazing hi-hat work and a wild bass drum placement during the verses (try playing along some time). On Wednesday, I drove down to Key Arena with Brenda. We were able to sit down at Michelangelo's in the Seattle Center House for a quick Italian dinner before heading over to the arena. As a Best Buy Rewards Card holder, I was able to pay an exorbitant amount of money for two tickets. (If you must know, $225 per ticket -- the most I've ever paid for a concert ticket). As we walked into the darkness of the arena halfway through Fiction Plane's opening set and saw how close we were to the stage, Brenda and I looked at each other and smiled. These were amazing seats! Brenda went out into the foyer to get water while I stayed and watched Fiction Plane. I'd never heard them before, and I was surprised how much I liked them immediately. The melodies were catchy, the songs interesting, and the singing unique. I knew the guy singing and playing bass was Sting's son, Joe Sumner, but knowing this actually raised my expectations. Fortunately, Joe seemed to possess much of his father's singing and songwriting talent, yet he was doing his own thing. 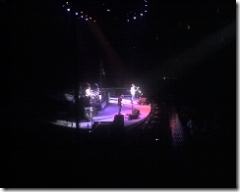 He also had two excellent musicians playing with him, Pete Wilhoit on drums, and Seton Daunt on guitar. 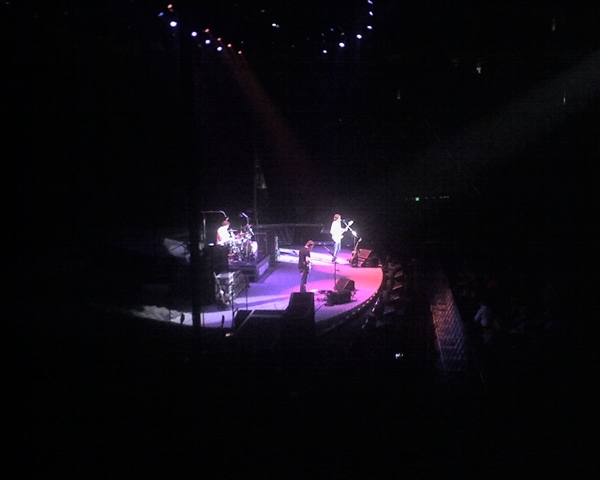 It would be a difficult job to open for a legendary band like The Police, but these guys pulled it off. During the break, we walked around Key Arena and ran into my brother-in-law, Dale, who is a huge Sting and The Police fan. He had just had a picture signed by Fiction Plane at a meet-and-greet in the foyer. He'd already seen two shows in Vancouver, B.C., and he was excited about seeing them again.In fact, he told me if my brother didn't want to go to the show the next night, he would buy the ticket from me. We went back to our seats and waited. The Wailers song "Get Up, Stand Up" blasted out of the PA. 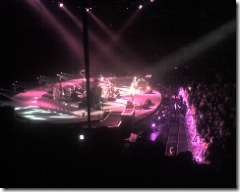 Finally, the arena went black, and Stewart Copeland walked out to his percussion stage, which was on an elevated platform behind his drum kit, and started warming up a massive Paiste gong. He hit it hard, and then jumped down to his drum kit. The familiar "Message in a Bottle" guitar riff started up, and the crowd went crazy. I had a moment seeing the three musicians on the stage where it almost seemed like a dream. After all, Sting said The Police would never get back together. The Police came out playing some of their biggest hits: Message in a Bottle, Synchronicity II, Spirits in the Material World, Voices Inside My Head, and Don't Stand So Close to Me. From my seat, it seemed like it took them until Don't Stand So Close to Me to start playing really well together. This was the fifth show on their world tour, so you can understand that they might be working out the kinks. Stewart Copeland's blog about how their second show in Vancouver, Canada, "sucked" makes you wonder what's going on -- but as he said in the blog, "Screw it, it's only music." Stewart Copeland had a percussion riser behind him that literally lifted up above his drum kit. He's one of the only other rock drummers who plays orchestral percussion (Neil Peart in the 1980s being the other). Songs like "Wrapped Around Your Finger" and "Walking in Your Footsteps" that include a lot of percussion were some of my favorites. Typically Copeland would start on the percussion -- and arsenal of crotales, marimba, bells, tympani, gong bass drums, rattles, and just about anything else he could fit up there -- and then jump down to his kit. Sometimes he made it just in the nick of time. The jam-band style on several of the songs, including Walking on The Moon, Walking in Your Footsteps, and Roxanne was really interesting and fresh. But while I sometimes get bored in jams from a band like, say, Dave Matthews, I never felt that way at The Police. 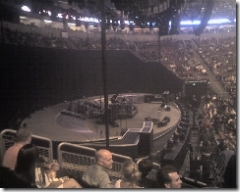 The stage was oval-shaped and completely open, so you could see around the entire band. Backstage was literally under the stage. The scrim with the dinosaurs in Walking in Your Footsteps was really cool -- the images almost creepy. 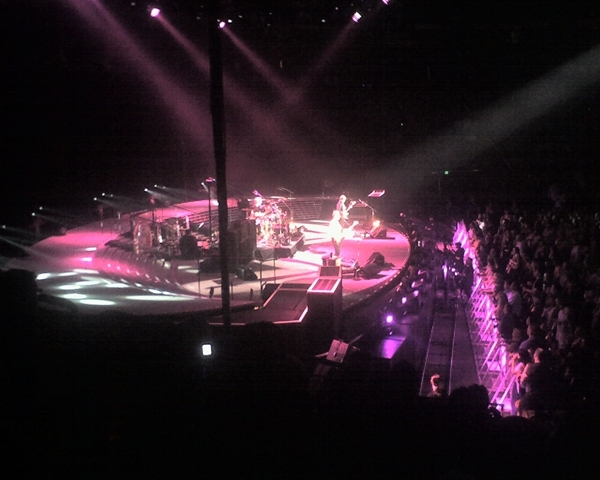 Sting did a slow "Walking on the Moon" walk around the entire stage during a new jam section of that song. The crowd singing along in Can't Stand Losing You. They've played it this way even on the Synchronicity tour, and it still works quite well. I liked how Sting kept saying to his bandmates, "Don't rush me! Don't rush me! We've got all the time in the world." The surprising guitar work of Andy Summers. His solos were especially inventive. And the new rockabilly guitar section of "Walking in Your Footsteps" was especially fresh. Oddly, Summers seemed to be having the most trouble on this night -- missing notes and looking extremely serious throughout. The sea of people taking pictures with their cell phones and cameras. Stewart Copeland ran around to the back of the stage and looked up at all he people sitting behind him. He said (and I'm paraphrasing), "Hey! There are people back here! And they're louder than the people in the front. Because they can see what we can see, and it's pretty incredible!" Stewart Copeland's final series of words to the audience, "Whoooooaaaaa!" When the concert was over, I was exhausted. My voice was hoarse, my shirt soaked in sweat. And I wondered how I was going to do this all over again the next day. To see more pictures from this tour, go to Flickr Groups: The Police. There are some amazing pictures there!